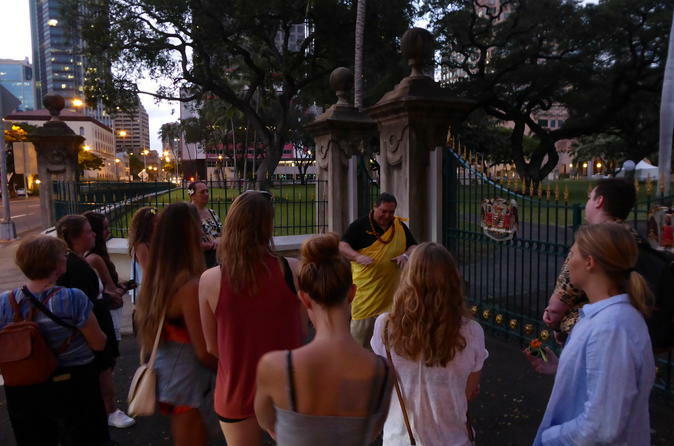 This cultural walking tour leads you through Downtown Historic Honolulu to follow the footsteps of Hawaiian Monarchs who once lived in Honolulu and established laws for the well being of society. The historic buildings stand as reminders of their accomplishments and their relevance to this day. Experience ho'okipa, Hawaiian hospitality by learning a chant, making a Hawaiian keepsake, participating in a traditional protocol to honor our ancestors and hearing the stories and history of our Hawaiian royalty. Experience Ho'okipa, a 1-mile, cultural walking tour through Downtown Historic Honolulu with nine stops. Starting from the Honolulu Cafe on Bishop Street, you will walk up Bishop St. to Financial Plaza, the financial district from the 1800’s to today. Then regroup at Tamarind Park to hear a story of Charles and Bernice Pauahi Bishop’s house. Then make a ho'okupu, a keepsake object. Walk to Kamehameha Statue, take photos, and then take a stroll to the Kawaiaha‘o Church. Walk to the Sacred Mound where you’ll hear a story on the presentation of the ho‘okupu. Walk to the ‘Iolani Palace, a high-tech wonder of the 1800’s. Hear about the Merry Monarch and the Queen in the Tower Paoakalani. Walk on to the ‘Iolani Barracks, where you’ll learn about the secret tunnels and the overthrow of the monarchy. Gather at the Gazebo to hear about Kalākaua’s inauguration and the The Royal Hawaiian Band. Experience a Hula dance of that era, and the finish the tour with a walk back to Tamarind Park. Please note: Wear comfortable walking shoes, bring bottled water, and any change needed for the parking meter (before 6:00pm). Hōkūpa‘a will donate $4 of your ticket price to Travel2Change, a nonprofit organization.